One of the questions I’m asked most often is where to get rocks to paint for rock painting. 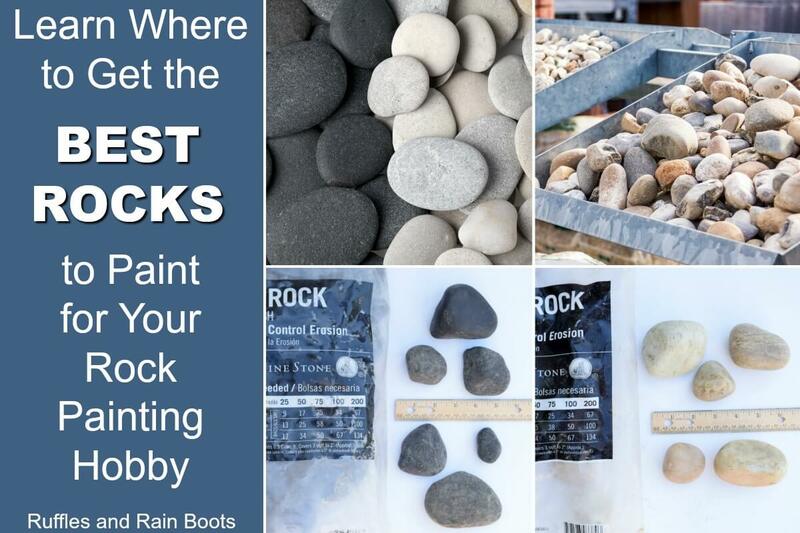 We share a lot of rock painting ideas here on Ruffles and Rain Boots, so we’re dishing about where the best places are to get rocks to paint! No matter where you live, you can get quality rocks to paint to support your rock painting habit! We’ve painted tiny rocks, big rocks, pieces of slate, and so much more without violating any laws or spending a small fortune. I’ve included where to get rocks for cities, the country, and even how you can paint rocks while on vacation or traveling! Be sure to let me know where you love to get your rocks for rock painting! 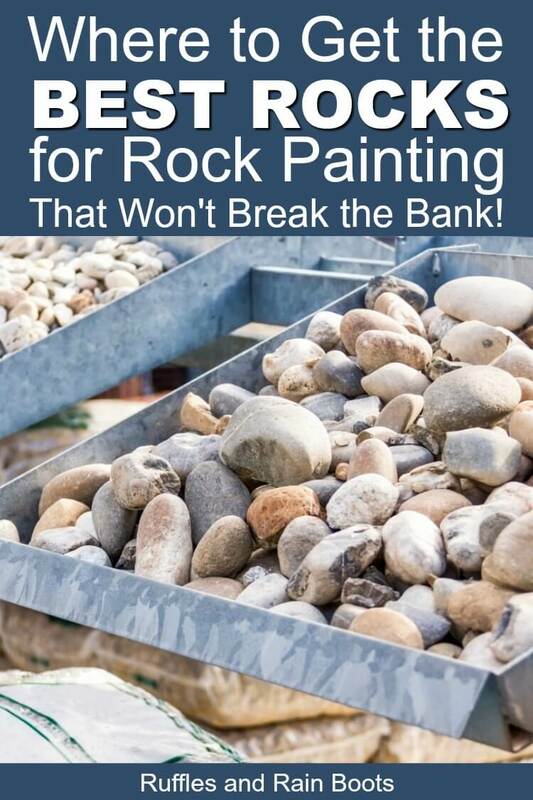 The “where to get rocks to paint” question was on my mind, too, when I first started. Because of the laws in my area, this is where I started: I buy a lot of rocks from home improvement stores and this is the option I recommend for most everyone. 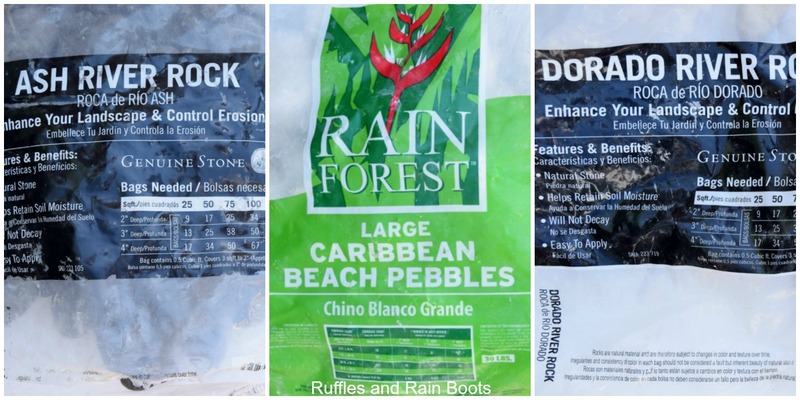 Below is an image of the three bags of rocks I’ve purchased at Home Depot at various times of year. 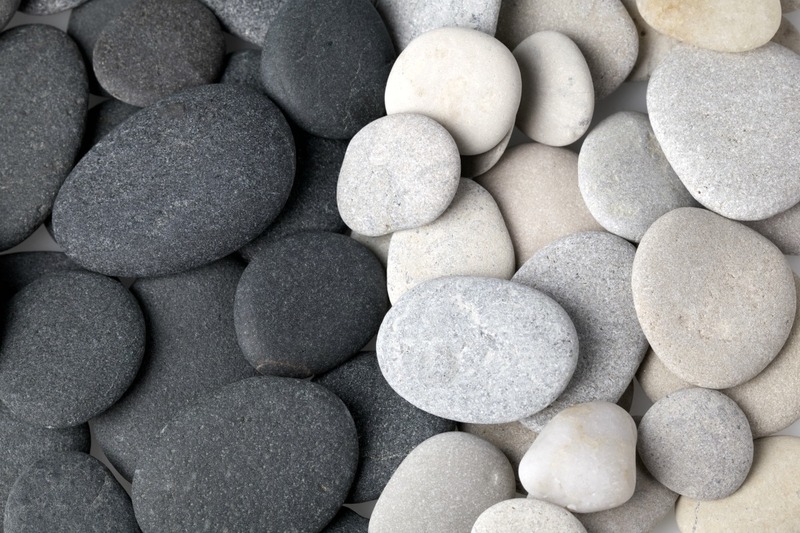 If you’d like to read more about each, read about the types of rocks for rock painting. Home Depot, Lowes, Mendard’s, and countless other home improvement stores are great places to buy rocks. You can buy slate pieces individually which is great for larger rock painting ideas or bags of rocks for a large selection. This is a GREAT option if you have a landscaping company near you because they let you choose your own rocks! You might have to explain why you want to choose your own, though. The first time I went to a local landscaping supply company here, he wanted to know why I only wanted a bucket-full and why I wanted to pick them out myself. But he allowed me to fill up my bucket with beautiful stones! I know some rock painters tell you to steer clear of rocks from the craft stores, but I do believe they serve a purpose. This is the riskiest option, in my opinion, but I am a conservationist so take it with a grain of salt. Removing rocks from nature can be a crime in your area, so before you take a bucket to collect rocks, check out the law. We were on a beach trip to the Oregon coast and the police (or park ranger) stopped a family from filling a 5-gallon bucket with rocks from a beach. Why? It was illegal and carried a fine. Did you know Amazon sells rocks?! That place sells everything. I purchased these rocks for rock painting on Amazon and the quality was excellent but they are not the most cost-effective option. 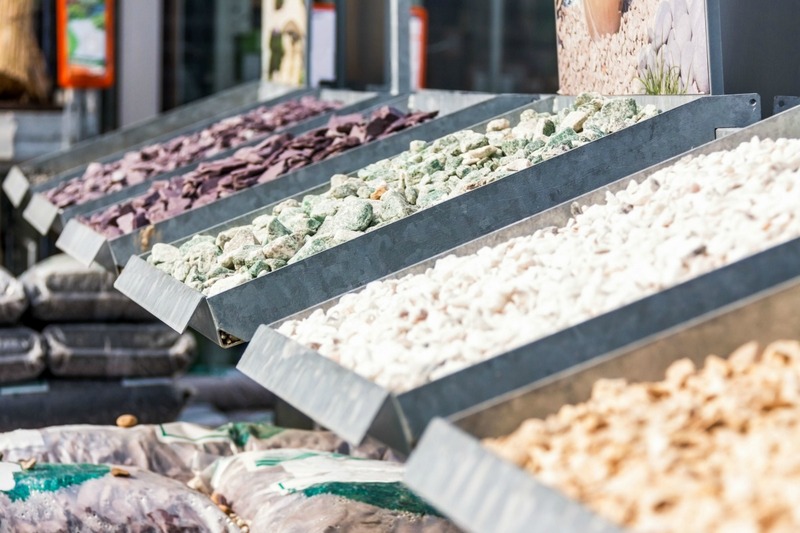 If you’re looking for flat rocks and only flat rocks, however, it might be a great option to incorporate into your rock painting. Additionally, you can look on Facebook in your local buy and sell groups to find people selling and trading rocks. I set up a meet at a park once so that I could see a rock before I bought it (it was a slab of slate) and I made a rock painting buddy! I’ve also come across someone selling a rare rock type from Greece on Facebook, so if you find a particular rock you want for a project, do a quick search. How about you? Where do you get rocks to paint to support this fun and additive stone painting habit?! Please pin this to your favorite rock painting board on Pinterest or share on Facebook. We’d love it if you helped us to get more people to know where to get rocks to paint. Have not had a problem with rocks from Dollar Tree. I sometimes paint a coat of chalk paint on first because most of them are black. I make magnets and have not any problems with paint – finding magnets strong enough to hold them is more of my problem. What a great tip – chalk paint is a life-saver, isn’t it? I bought rocks at Dollar Tree and they had a finish I couldn’t paint over. I tried several ways to get it off. Ended up throwing them out. Won’t make that mistake again. I love that you mentioned that! I’ve heard many people had that problem with Dollar store rocks. Some people boiled them (in a nasty, old pot) to get the waxy coating off. But I’ve never even seen them at the Dollar store, so I haven’t had a chance to test that. I bake them in oven to melt that waxy film off. I line my pan with parchment paper and bake at 250 degrees. I have boiled them but it is messy and not as clean as baking. I also bake my rocks that I bring in to make sure they are good and dry. In the spring I was having trouble with spray paint not drying. Since I started drying in oven first. well, I have an advantage that most people don’t, My husband runs heavy equipment and is always digging & moving rock, so i have access to all the rock i want. plus we go to the North Georgia mountains alot & I can get rocks there too. Whoa – I bet that’s awesome to be able to choose any size and color. Lucky you! I got a bunch from dollar tree and it was the best deal ever!